I was itching to escape the hurly-burly of the pre-Christmas High Street and the endless loop of piped seasonal music. I like the Pogues a lot but there is a limit to the number of times I want to hear `A Fairytale of New York` on a single, overcrowded shopping trip. So, with the weatherman in an optimistic mood, I was off, fleet-footed, to Upper Coquetdale for my last hill walk of the year. Three miles out of the tiny village of Alwinton, the buildings of Shillmoor stand where the Usway Burn bursts into the River Coquet. It was the ideal place to start my walk. I parked close to the river, pulled on my boots and then, with the winter sun already beginning to add warmth to the morning air, I headed for higher ground. I was soon climbing the steep south eastern slope of Shillhope Law pausing occasionally to take in the view. A film of mist obscured much of the finer detail revealing little more than the faint outlines of the surrounding hills and the occasional haze-piercing sparkle from the River Coquet. By the time I had reached the delightful ridge across the subsidiary top of Inner Hill the sun had chased away the mist and the Usway Burn could be seen in all its glory, twisting and slithering like an adder, way below. 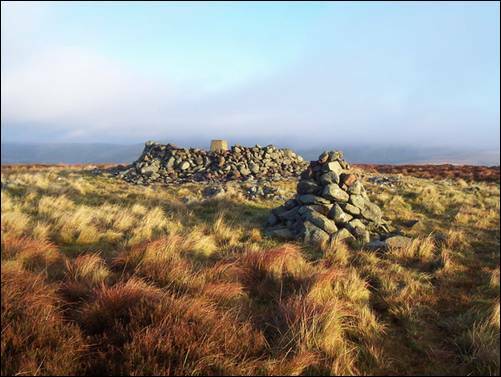 I continued upwards through bleached white mat grass towards the triangulation pillar-capped top of the 501 metre high Shillhope Law. Once there, my effort was well rewarded with superb views to Windy Gyle and the distant Cheviot. The three summit peat pools mirrored the now almost clear blue sky and, as I sat beside a tumbledown stone shelter, I wondered whether I was the only soul for miles around. It certainly seemed like it. It was too early for lunch, even by my standards, so I pressed on, first downhill and then across soft, green turf towards the prominent Kyloe Shin with only a smattering of white-faced Cheviot sheep for company. I then entered the semi-dark confines of the Kidland Forest before emerging once more into daylight a mere stone`s throw from the perfect picnic spot. To many a walker a visit to Hazely Law would seem like an unnecessary lung-bursting detour but, on a December day masquerading as a rather pleasant October one, it seemed a perfectly logical place to take a well earned breather. The sweet mince pies and the slab of fruit cake were a tasty bonus. Back on course, I still had more than 5 ½ rollercoaster miles to cover before I could finally draw the curtain on a wonderful year of walking. The sun continued to gently caress the surrounding hillsides and, by the time I arrived back at the River Coquet, I was ready to move onto my next major objective, the Christmas festivities. I started up the car, switched on the radio and, as Shillmoor disappeared in the rear view mirror, the familiar sound of `A Fairytale of New York` came drifting across the airwaves.